This is no safe level of exposure to secondhand smoke. Children exposed to secondhand smoke are at an increased risk for Sudden Infant Death Syndrome, acute respiratory infections, ear problems, severe asthma, and reduced lung function. More people die every year from smoking than murder, AIDs, suicide, car crashes, and alcohol combined. Quitting smoking if you are not already a nonsmoker. 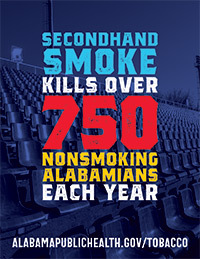 Learn more about the Alabama Tobacco Quitline. Learn more about what's going on locally in your county and how you can help by reaching out to our Tobacco Prevention Coordinators. The following graphics are available for you to download, print and share.